The answer is that like a good painting or a good song there seems to be so much there to consider and reconsider. That building is unusual for me because it’s possibly the building I like most but it also exceptional in that it is a building from a period of monumental planning and design disasters; it is fabulously difficult to photograph well. There are many buildings that make better photos yet which aren’t worth five minutes of a look. What’s important here is more that I don’t generally think of individual buildings when I am not being confronted by them whereas I may think of a song, an artwork or a car independently of whether I am confronted by one at a given moment or not. I do, however, think of places even though I may not be in them at the time. The next point of comparison is that in terms of aesthetic content, the Lancia, Morandi or a song seem very direct and comparable. In contrast, many buildings, and here I am thinking of very good ones, almost fall below the threshold of interest; it is as an assembly (a street or plaza) that the aesthetic content of buildings takes on greater force and at the same time the authorship diminishes because a street or a square is a collective effort. It’s almost as if the urban scene becomes more like a natural (unintentional) setting. Returning to the level of units, buildings unlike songs, paintings or cars can lack the tension between form and semantic aspects. Even the Berkeley Library is straightforward: it has the right bits in the right places (is it arbitrary?). A painting is a story of some kind even if the story is “here are some pots”. Morandi is not arbitrary at all (but Pollock is and much less interesting). A car is far from arbitrary and it conveys images or narratives; a car design can ask you in the best cases to imagine another reality; it can also ask to be deciphered and analysed so one puts function, form and brand values into play against one another. Songs have the immediate aesthetic impact of musical sounds – think of the astonishing range of colours and tones conveyed by guitars alongside the nuances of the vocal performance. All of that serves the progression in time of the notation. These meditations serve to highlight the curious phenomenon that objects like the Lancia (Lancia’s most architectural car?) make one want to head back to them for yet another thoughtful gaze (step forward, Fiesta) and most buildings don’t, delightful as they are. And that’s why I find myself posting another example of the Thema. I’ll pay more attention to the interior here. You have to enjoy the tussle between comfort and sobriety to get the most out of this space. That’s not an easy sell in this era when even the cheapest car interior is sculpted like part of a Gaudi buildings and when moving up the class hierarchy quickly leads to material and textural excess. Stucture? How can this be understood? Hekkert and Desmet provide a framework for appreciating a design: 1) aesthetic experiences, 2) meaning experiences and 3) emotional experiences. The Lancia ties this trio up in knots. The pleasure of the interior is the simplicity or the restraint of the stimulus (a cool glass of water, Philip Glass) allied to the idea it’s well-made; the experienced meaning relates to the brand’s history and what it means to unite austerity with quality which leads to an emotional experience that is surely derived from the first two. Personally, I find it emotionally satisfying that the car is so restrained without being uninteresting. The intellectual consideration leads to emotional pleasure. The next thing is to ask ourselves if the reason buildings may not satisfy as cars, songs or paintings do is because they do not land fully inside the framework of product experience? And does this car also show us that the three parts of the framework of product experience are entangled? Lancia experts: is it true the PRV6 was used on this car and then, later the Alfa Romeo 3.0 V6? Other versions of “Betty Wrong” here and a live performance here and the studio version here. >>is it true the PRV6 was used on this car and then, later the Alfa Romeo 3.0 V6? 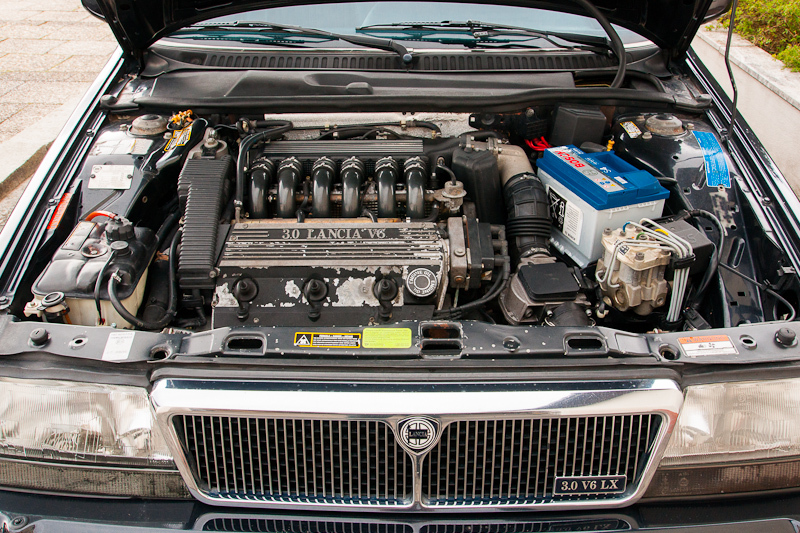 Initially the Thema had a then new 2.85 litre version of the PRV and after the Alfa takeover it got a slightly de-tuned version of the 3.0 Alfa ‘Busso’ engine optimised for smooth running instead of maximum power as in the Alfa 164. I´d never have expected that. Presumably for the launch year Lancia considered the PRV6 better than anything in-house and then, later, the Fiat Group V6 became comparatively better. I suppose…. Alfa was taken over by Fiat two years after the Croma/Thema appeared on the market. During the time of their development there surely was no thought of using the Alfa V6 in these cars and surely Alfa wouldn’t have sold the engine to Fiat. Was the Alfa engine any better than the PRV? Depends on your point of view. The PRV surely was less dependant on maintenance and had chain driven camshafts instead of toothed belts. I’m also quite sure it was cheaper to make than the expensive to build Alfa engine. It also was less sensitive to abuse and didn’t eat its head gasket if it was thrashed while still being cold. But it had much less power (150 hp from 2.85 litres against 171 hp from 3.0 litres in Thema guise), much less eager throttle response and was worse in the NVH department. The Alfa also sounded much better even if in de-tuned form it was not as melodical as in the 164. Both engines were anything but frugal. I had forgotten about the chronology of the Fiat takeover…. now it makes sense. It’s amazing that the Busso engine (expensive to make and to run) found its way under the bonnets of the Thema and Croma. At least these became all-Italian cars and in everyday use the Thema V6 wasn’t any slower than an 8.32 and sounded nearly as good. The Alfa V6 leaves the PRV unit for dead in the underbonnet aesthetics stakes. Does anyone admire engines for their looks anymore, apart, of course, from show-off supercars? I’ve never even seen the engine in my Boxster, or the one it replaced, and the Mini’s is completely concealed underneath a black plastic cover. I’ve fond memories of the Berkeley Library from my time at TCD. It was a very comfortable building, despite its rather forbidding appearance. Likewise the Arts building and its excellent lecture theatres. How we missed the latter when we were exiled to the draughty old Science building from second year onwards. The Berkeley is stunning bit of architecture inside. I used it too. And then I found a rat hole in the Museum Building for the last two years. Why were the limitations of the 60-degree Fiat 130 V6 that prevented it from being mounted in FWD applications like the Thema / Croma (and Gamma) compared to the 90-degree PRV V6, let alone from receiving further devleopment like later versions of the related Fiat 128 SOHC 4-cylinder engines? The Lampredi-V6 was made in negligible numbers and surely was a big loss maker for Fiat. It was heavy (cast iron block) and didn’t respond well to tuning efforts as even Abarth couldn’t extract more than 200 hp from a 3.6 litre version in their Giro d’Italia prototype. The PRV at least was relatively light and was made in kind of sensible numbers. It is a pity the 130 V6 was developed the way it was instead of becoming much more useful to Fiat (beyond the V6 being considered for the Gamma and Montecarlo), perhaps Fiat in retrospect were better off gaining the rights to use the developed Maserati V6 (and planned 4-litre V8) unless Fiat themselves had something better in the works which never reached production yet could have found its way into more cars? How could Lampredi’s V6 have been useful for Fiat in Italy’s economic disaster after the oil crisis? Cars with engines that large simply didn’t sell in Italy. There were 208 Frraris, 2.0 Alfa V6s and 2.0 Gammas and Alfa’s whole Alfetta strategy collapsed because nearly nobody bought large cars any more in Italy and certainly not from Fiat. The heavy and tall V6 definitely would have been the wrong (even wronger) engine for the Gamma and would have turned it into a nose heavy understeeering monster (instead of the agile fun car with fragile engine it was) and I doubt that there was enough room in the Montecarlo to fit the V6 transversely. Had they wanted more power for the Montecarlo they simply could have fitted the carburettors of the later Ritmo 130 (as many owners do) for nearly the same power or they could have used the Abarth four valve head for the Lampredi four. There simply was no need for a Fiat V6. The Gamma and Montecarlo V6 proposals were ones have read usually being mooted for the 130 V6. Am merely saying the 130 V6 could have been better developed then it already was to display a similar adaptive potential to other V6/V8 engines in Italian market (from Ferrari, Maserati, Alfa, etc that spawned 2-litre variants some even featuring turbos or IIRC the odd supercharger aside from the TVR 2-litre V8S). Was also under the impression that Fiat investigated other large engine configurations prior to the fuel crisis. Even in this application the engine had no more than 200 hp from 3.6 litres. For proper power it would have needed completely new cylinder heads without the unhappy contorted routing of the exhaust ports. Maserati’s V6 was a reliability nightmare as every SM owner will readily agree. Lampredi was a reliability fanatic and never would have used an engine with a camdrive design with only three teeth of the chain sprocket in contact with the chain as on the inlet cams of this V6 (and its cam drive being the source of most reliability troubles). Maserati’s engine also lacked power – just the same problem as in Fiat’s engine. Understand. So apart from Ettore Zaccone Mina’s unbuilt 120-degree V6 unit (that was said to be capable of both FWD and RWD applications) Fiat basically had nothing suitable as far as 6+ cylinder engines were concerned, let alone anything close to an analogue of the Alfa Romeo V6? The PRV6 is a pretty hopeless V6, the later split crankpin even fire variant is not as bad as the weirdo odd fire early versions though. It also has a reputation in the US for extreme fragility, although what European motor doesn’t? The Volvo red-block pushrod engine, B18 and B20 were legendary. Haven’t heard much against the later 2.1 and 2.3 OHC conversions either, but the PRV V6 eventually ended up in the Eagle Premier when Renault was at the height of its discomfort running American Motors — Chrysler then almost immediately bought them, and soon turfed the engine, no surprise there. Never heard a bad word about the Alfa V6 either, but there weren’t many around to be honest, the 164 never quite looking much more than a pleasant squarish wedge in comparison to the eulogies reserved for it here, so sales were low and mostly four cylinder anyway, which was a development of the next item. Speaking of Alfas, the four cylinder 1600 to 2000 DOHC was highly regarded for decades, as well as the Mercedes straight sixes from the ’60s and ’70s and ’80s, and of course the King, the VW aircooled flat-four and some versions of various Porsche engines. Nothing English (except Detroit-owned) or French, though, and no grinning chap standing next to an original 500,000 mile BMW for a photo op sums up those low achievers. The Kent Ford was robust, as were Opel CIH engines which always sounded busy rather like Mercedes sixes, and the Ford Cologne V6 was a tank, ended up being produced literally in the millions. So really it was just the native British and French engines that weren’t highly regarded except perhaps a minor mention for the 1390cc Renault clatterer, but the cars dissolved so rapidly nobody got a chance to test their longevity – my brother had a Renault 5, spent ridiculous money keeping it up but never touched the engine. The Alfa V6 is relatively long lived particularly when considering the heavy right foot of the typical Alfa owner. It had a couple of bugs that only were cured after Fiat invested proper development money like head gaskets prone to oil leaks because oilways were sealed by separate Viton rings and engine temperature compensated cam belt tensioners(!) that notoriously went wrong. After the Fiat takeover the engine got one piece head gaskets and spring loaded cam belt tensioners that were trouble free. Early four valve versions for 164 QVs had slipping cam belts (and expensive engine repairs) because of a design fault in the tensioning mechanism that was put right for the 156 and GTV 916 (and later) installations. actually renders its block & internals sizing / bank-angling relatively sturdy. did not translate to reliability. MVS, in their somewhat unjustly underrated Venturi sportscar. Just a quick reply to Bill Malcolm re notable engine. You mention Renault in passing – I think the Cleon engine deserves a mention – it was produced for some 40 years in a variety of sizes and ultimately with turbocharging. I has a 1.4 in a Renault 5 around 1986 and while the car was a bit fragile the engine was brilliant – smooth, linear in power delivery, lots of low-down power and made the super-light 5 go very quickly. The Turbo GT of course went much faster again! And I completely forgot that a 1.1 version of the Cleon also powered the first-ever car I owned, a DAF 55 inherited from my grandmother in 1980! The car was just brilliant and the engine suited the CVT to a T. Left me with a life-long love of clever transmissions and an equal suspicion of rubber belts – but perhaps I should not have taken four people up Wrynose pass. We got to the top (thanks to the Cleon and the brilliant gear spread – there was a green push-button for holding low gear – and made it safely down but then both belts snapped…. Well we were all students and it seemed like something worth attempting! I take issue with the notion that anything about buildings make them inherently less interesting than cars. This being a “Motoring Site” (the best I know), it may be unsurprising that the statement could stay unchallenged for this long. But try posting it on some BTW (Built to Write?) – Architecture equivalent of this lovely little universe we are having this discussion in. I think the comments may be of a different nature. Take the Mercedes Benz Museum in Stuttgart for example: I find it really hard to say what I was more impressed by, the building or the cars. I can´t disagree with your point about the complexity of buildings. And I spend a hell of a lot of time looking at them and thinking about them as single entities and as collective assemblages (planning). And yet I find the aesthetic impact of buildings at a far lower level of intensity than a motor vehicle, painting or song /music. I was trying to get at why I felt this. In part it´s the arbitrariness of buildings. I would certain not deny the importance of architecture or its pedigree. part of a street or a block. easier to swallow and relate to on an individual level. and even in its predominant weather environment.